If you've never heard the name Pablo Escobar, then you've either lived under a rock, or have snorted so many rocks that you don't even know your own name, let alone his. But to sum it up, the infamous Pablo was the leader of one of the most violent and wealthiest criminal organizations in history — The Medillín Cartel. 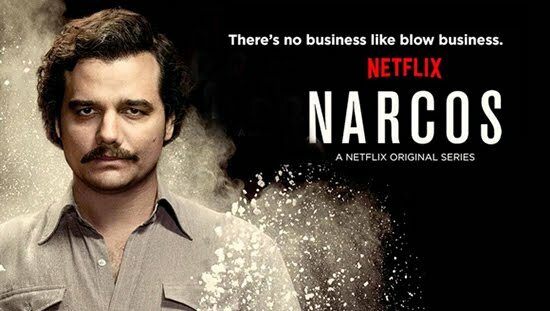 The beauty about Narcos is that it tells the true story of the U.S. and Colombian efforts to battle this ruthless cartel during the cocaine-fueled drug wars of the 80s. Hell, it was scum like this that caused the saying "Just Say No" to be burned in my brain till the day I die. Well, him and the lovely Nancy Reagan. Thanks Nancy! Nevertheless, if you're looking for a cold-blooded, vicious, down right sadistically shocking series that'll leave you asking yourself how one man could be so damn insanely savage, then give this show a try. Its so addicting you'll burn through the first 10 episodes and be left wanting more. Kind of like a... well, you get the idea.